Ever since I’ve known how nutritious and beneficial turmeric is, I try to include it in my savory dishes like this lentil stew, but “in a drink?” That was my thought when I heard about golden milk for the first time a few years ago. Upon my dad’s advice to try everything at least once, I tried this drink and didn’t like it at all. But then there’s another saying which goes a little something like “you have to try the same thing a few times before liking it”, this goes especially for all new/ unknown tastes. And it’s true – just watch a baby tasting a lemon for the first time (it’s the cutest thing ever). So I did try it again and again until finally, I created a mixture I really enjoyed. In the end, it’s the perfect drink for a cold winter night and I also love having it whenever I feel I’m getting sick. While there are a lot of food trends popping up here and there and I usually don’t hop on that train, this one is actually worth sharing because it really is a good one. 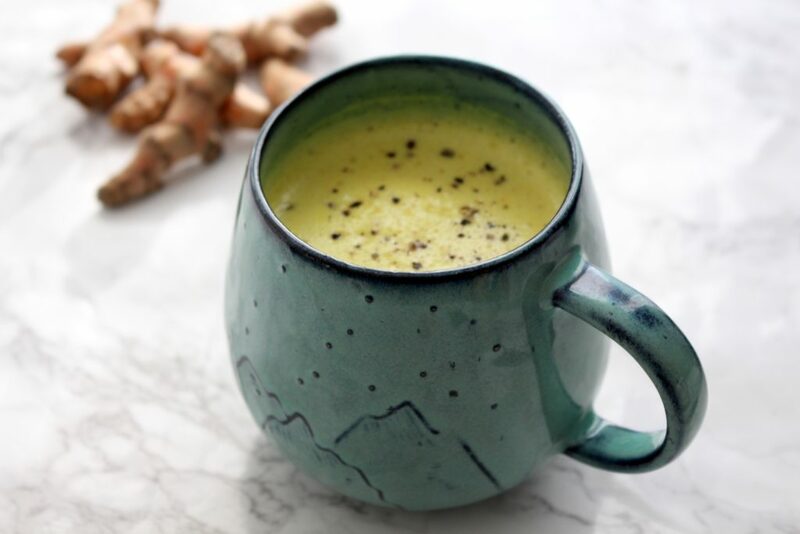 That being said, it’s not even a real trend since it’s been around India for centuries, where it’s known as “Haldi Ka Doodh” or “Golden Milk” and turmeric is rumored to have enormous healing powers. 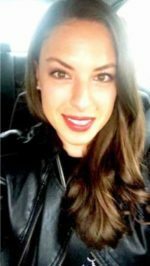 I don’t think I need to go into detail here on why and how turmeric benefits your health because there’s a lot of information provided by experts on that matter already. I’d like to sum up the most important things to know about this yellow root down below though. Turmeric stains everything. I learned this the hard way even though I knew this was going to happen. So if you don’t want your hands and nails to be yellow for days, listen to my advice and always (!) wear gloves when handling fresh turmeric. As always fresh is best. But if you can’t get your hands on fresh turmeric, use powdered turmeric. In this case, I would make sure it’s a good quality. Turmeric is absorbed best by the body when taken with black pepper and some kind of fat. Indians typically use ghee (butter) while I prefer vegetable oil like canola or coconut oil – use whatever kind of fat you feel like using though. 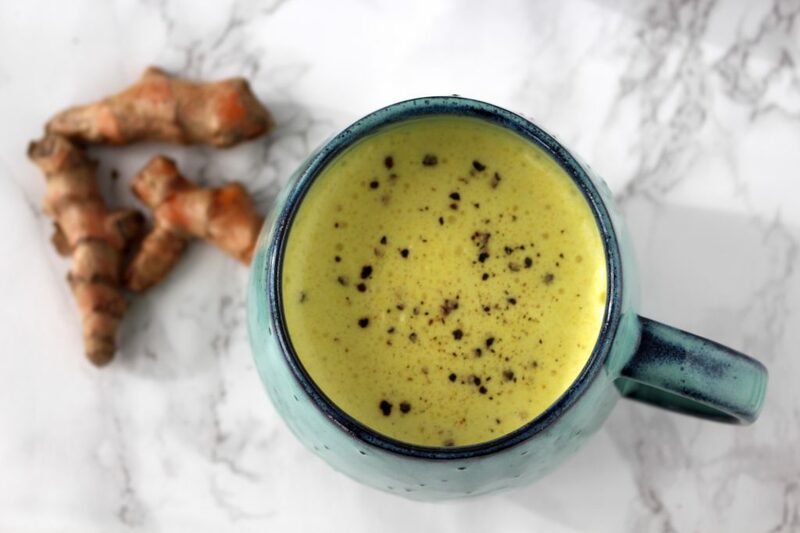 Turmeric Latte is the trendy way to drink it. So if you want foam on your golden milk, simply use a milk frother and have yourself a golden latte. 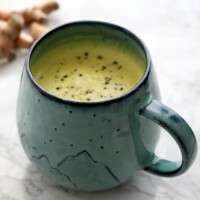 There are two ways to make Golden Milk: either by using fresh turmeric and blending it right into your milk or by making a turmeric paste of turmeric powder before adding a spoonful of the paste to your milk. Peel the turmeric and ginger and place in a blender together with about 1/3 of the milk. Blend until broken down completely. Pour the blended milk into a saucepan and add the rest of the milk. Turn the heat to a medium and warm the ingredients together just until small bubbles start to appear on the edges (right before it starts cooking). Turn the stove off and let sit for about 3 minutes in the pot with a lid. Pour golden milk through a fine sieve into a cup. Add oil, sweetener, and cinnamon if you like and stir well. Enjoy warm. Make turmeric paste: add turmeric powder to a pot with 1/2 cup water and cook for few minutes until you end up with a paste. For 1 cup of golden milk, add 1 tsp of turmeric paste to a pot, together with milk and grated ginger. Turn the heat to a medium and warm the ingredients together just until small bubbles start to appear on the edges (right before it starts cooking). Turn the stove off and let sit for about 3 minutes in the pot with a lid. Turmeric stains everything. Keep that in mind, when peeling, blending and even drinking turmeric! I hope you love this recipe – please let me know in the comment section below! If you make this golden milk, make sure to take a photo and share it on my Facebook page or on Instagram, using the hashtag #minamadefood. Oh and don’t forget to tag me (@thisisminamade) so that I can see your creations!